Goop seals punctures in the tread area as they occur, reducing the risks associated with sudden tyre deflation particularly at high speed. While driving, Goop centrifugally coats the inside of the tread area. If a tyre is punctured, the escaping air carries the sealant to the hole, where the rubber particles and binders combine to form a flexible plug, instantly sealing the leak. With the typical family car tyre being expensive and potential roadside assistance charges costing, too, the cost of a puncture can quickly mount up. 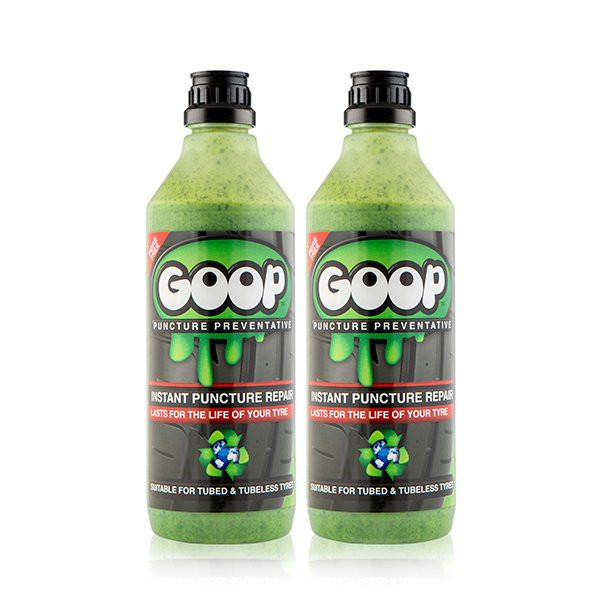 Reduce the risk of high speed Punctures with Goop. 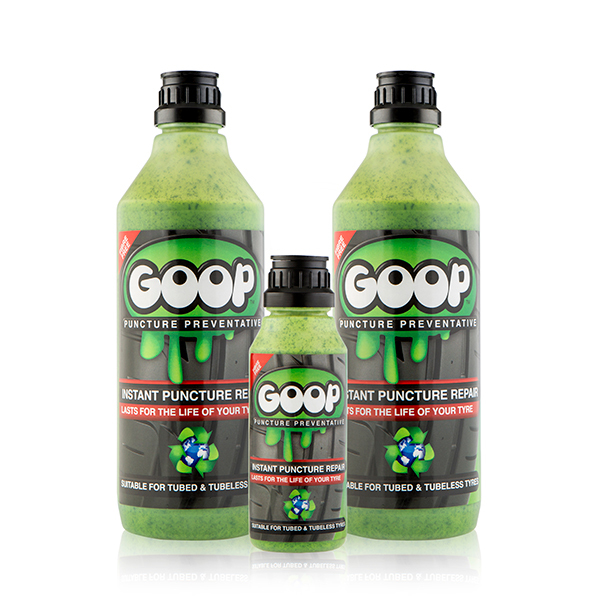 Goop is designed to seal small punctures in the tread area, such as those typically caused by thorns or nails. Prevents air loss through corroded alloy wheels. lasts the life of the tyre. Goop is a well-tested and trusted product that has been put to the test over very many years and has passed with flying colours. 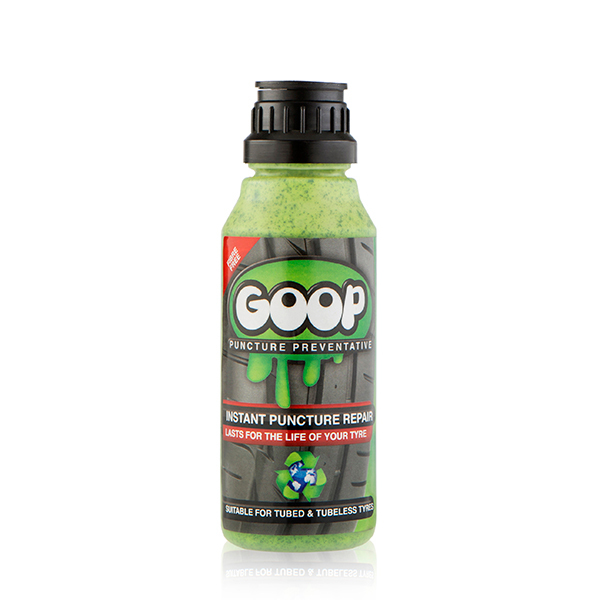 Goop has been on the market for over 20 years, Goop helps to prevent punctures and maintain optimal tyre pressure. Prior to Goop going to market extensive research, development and testing was conducted (internally). Goop is formulated and manufactured in the UK. Unlike other fibre' based products, Goop has been developed using finely ground rubber particles, to prevent the problems caused by fibres blocking the valve during installation, and balling up' in the tyre during use. This happens eventually with any fibre based product due to centrifugal force, thereby causing the product to become less effective in sealing punctures, due to the fact that there are fewer free active' fibres left in use to seal potential punctures. Goop is not only green in colour, but also green by nature. It is non-toxic, non-flammable, water based, and will not harm tyres, tubes, or the metal of the wheel rim. When the time comes to change the tyre, Goop can be safely washed away with water, causing no harm to the environment. Tyre wear and fuel consumption both increase when your tyres are under inflated. By protecting against punctures and maintaining optimum tyre pressures, Goop can help you improve your fuel economy and the life of your tyres. 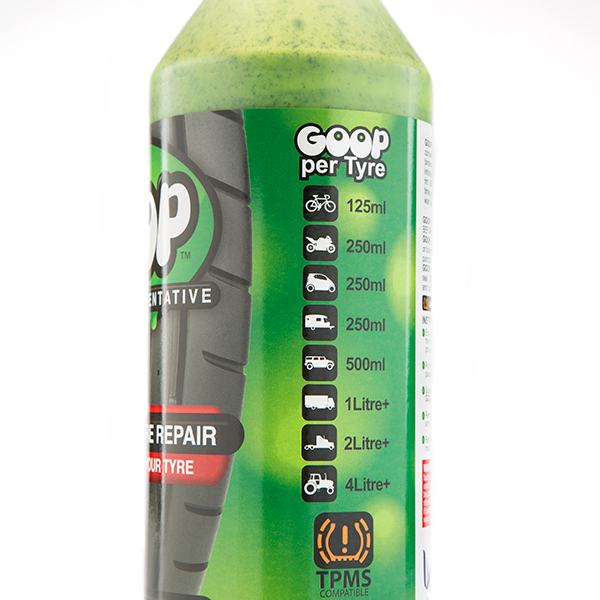 Unlike many of its competitors Goop is suitable for both tyres with or without inner tubes. Goop can help prevent air loss from alloy wheel rims, which tend to corrode internally after several years, and this corrosion allows air to start leaking slowly, with the need for regular re-inflation. When installed Goop spreads throughout the tyre, sealing the rims and helps to prevent air loss. Goop is a stable solution and does not deteriorate over time and provides a permanent seal for the life of the tyre. Washes out without leaving any residue for easy tyre repair. Goop is a water based solution. When the time eventually comes to change the tyre or tube, Goop will simply wash away with water, leaving a clean surface with no sticky residue left behind on the wheel rim. You can clean it off of any surface with a rag or a towel. Goop is a non-toxic Aqueous Glycol solution containing finely cut rubber particles, preservatives, binders, suspension agents and anti-corrosive inhibitors. Simply deflate your tyres and add Goop using the integral applicator tube. Replace the tyre valve with the handy tool provided and re-inflate to the recommended pressure. It's that quick.